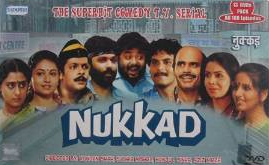 Episode 5 of Hindi TV Serial Nukkad is focused on the importance of togetherness. As a social animal a human cannot live his/her life at full, without having people to share the joy and sorrows with. There are rules of business and trading, but there are some relations or practises which are above all those rules. The episode however is not the best of the season. Some of the points it raise are not very effective, but then also, it is definitely worth watching. We see that the changes around the world are started influencing Kadar – aka Kadarbhai – the tea-post owner. He too have decided to do business systematically. He introduced a slogan – No credit, Only cash – for his customers. Personally, we don’t see anything wrong in the same. And by the way, as the owner of the business, he have right to do so. The thing which is not so good is his – too much systematically – attitude. For example he asks his aide to count the pipperment and chocolates periodically! And same he do for the biscuits, glasses and almost everything. One have to determine the limits in anything he/she do. Otherwise, it could be turned into hypocrisy without even the knowledge (of the person who is responsible for the actions). This is where, we think Kadar gets it wrong. The people who are doing their small business at Nukkad are not rich fellows. In fact most of them are living on their daily income only. Whatever they earn, almost the same would be used throughout the day for living by them. There is a tradition that people try to inject some energy inside by having the morning tea when beginning their business day. Now as they are almost empty-pocket, they don’t have money to pay Kadar for the tea. And without tea, they don’t feel ready to do daily job and earn money. That is the reason, they go for credit. So the change Kadar have introduced is quite a problematic for them. They try to convince Kadar to not to follow the rule rigidly, but Kadar was stubborn on his decision. What happens then after is the rest of the episode. We can the writing could have been better (in terms of overall episode script), the dialogs are quite good though. The director does his job with to-the-point approach, which definitely works in favour of the TV Serial. The background music is good too. The love and affection amongst the people of Nukkad is explored really well. There are no larger-than-the-life sets/characters or wardrobe accessories. But, you don’t even feel it for once. The simplicity in execution makes it classic. Be it Avtar Gill, Sangita Naik, Dilip Dhavan or Pavan Malhotra, they are in their top form. They are convincing enough and you will not realise that they are acting. The episode is not a full satire, but it takes a couple of valid digs to money oriented world effectively. The DVD quality is good, however as the original content was filmed with technological limitations, you may find the video quality little dull (as you often watch HD content these days). Overall it is really a nice episode to watch.